Perler beads—the small plastic beads that fuse together when ironed—were a favorite craft project material with Em and Dan for years, especially when they were younger. For a while we had stacks of the melted bead designs the size of coasters lying around, but attempts at more elaborate constructions proved difficult to execute without breakage. That’s why French designer Sabine Ducasse’s Melting Pot fashions are that much more impressive to us. Ducasse used the beads to create East-meets-West armor style fashion; a melting pot of cultures with a literal take on “melting”. 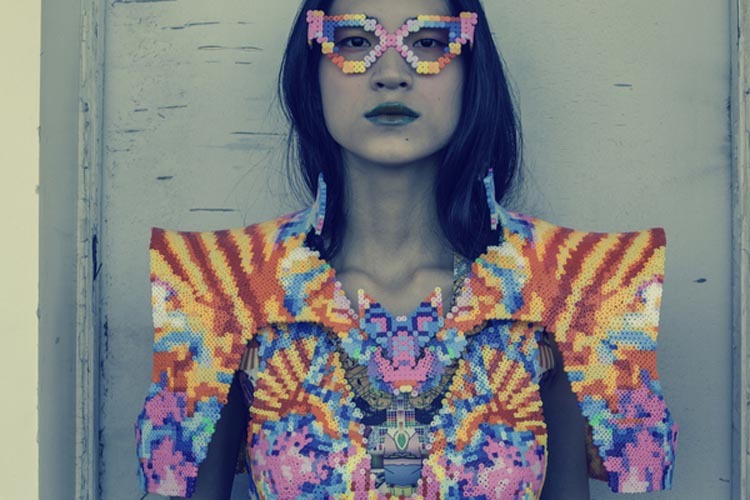 These amazingly well-crafted pixelated design pieces won the designer a scholarship at the International Fashion Academy. Nice! This entry was posted in Art, Fashion, Just Plain Cool, Pop Culture, Stuff We Like. Bookmark the permalink.